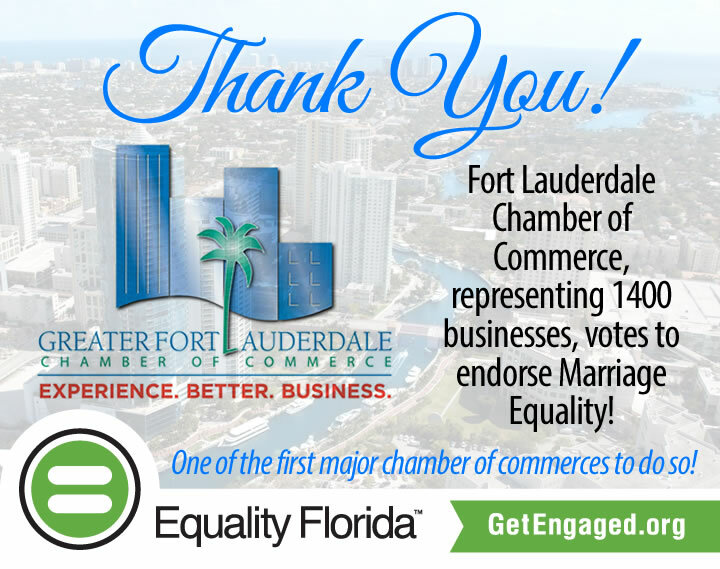 The Board of Directors of the Fort Lauderdale Chamber of Commerce, the largest organization of businesses in Broward County, Florida, has approved a resolution in support of marriage equality, adding yet another collective voice on this important economic issue. The Chamber is the first integrated Chamber to bring this resolution forward, and they intend to contact and inform appropriate organizations and individuals regarding its position as government and the courts continue to work on the issue. This significant resolution was initially proposed by the Chamber’s Gay and Lesbian Business Exchange (GLBX), a council within the Greater Fort Lauderdale Chamber of Commerce. With nearly 200 active members, GLBX is one of the Chamber’s most active councils. Whereas, marriage equality represents billions of dollars to Broward County's economy. Now, therefore, let it be resolved that the Greater Fort Lauderdale Chamber of Commerce supports marriage equality in the State of Florida.